A Joint Solidarity and Independent Labour Party pamphlet about the Committee of 100. For Solidarity this was pamphlet number 10. A pdf of the pamphlet is attached. "Every sane human being should pause and ask himself a simple question: who are the real conspirators ? Us or them? "The Government uses secret police to break into offices, to steal papers, to open letters. Its agents search people in their homes in the early morning. It taps telephones, sends spies to meetings, whitewashes its own brutality and lies in court. "The real conspirators are those who prepare mass murder and lie to our people about it. Wethersfield is a base from which the extermination of millions of men and women will be launched. "The Committee of 100 offers people a method of struggle for decency and dignity. It says to people: see the evil and act for yourselves. Do not expect the corrupt politicians to act. Do not expect the Press to tell the truth. Do not expect the courts to do justice. "We say to the people: learn from your experience. As you become more effective, the government will seek to destroy civil liberties. They bring in troops. They talk of conspiracy. It is the Government itself which is an evil and criminal conspiracy. It risks our lives, plans to kill millions, says war is peace and lies the truth. It seeks to intimidate those who struggle for human survival. The mask is off. The people shall see and resist." The above is an extract from a letter sent to the Committee of 100 and to the Press by Pat Pottle, while 'underground' and being sought by the police. The Press refused to publish the letter. This pamphlet is an attempt to analyse the implications for socialists of the activities of the Committee of 100 and the repercussions of its actions. It was written by members of 'Solidarity' and the Independent Labour Party, who are active supporters of the Committee. The official Labour Party view was put by Mr. George Brown, the Deputy Opposition Leader ". . . a declared intention to disrupt the forces of law and order cannot be permitted in a modern democratic State". Tories cheered and Mr. Renton (Under Secretary to the Home Office) welcomed these words.—Daily Mail, 8th December, 1961. Most members of the Committee of 100 have no illusions that we live in the kind of State described by Mr. Brown. No illusions whatsoever. In fact, the need for a body like the Committee is eloquent testimony to the shallowness of the 'democracy' the politicians prattle about. During the last year the influence of the Committee has grown. Its impact on the consciousness of young people has steadily increased. It has learned important lessons in the course of struggle. And at each stage of this process the fraudulent nature of Mr. Brown's 'democracy' has been revealed to more and more people. We intend in this pamphlet to document the growth of this mass consciousness. We intend to document it, not as an abstract essay in sociological analysis, but in order to assist its further development. We will show how the actions of the Committee have cut through the cant and hypocrisy that shroud so many of our institutions. When confronted with a serious challenge, the Establishment has repeatedly revealed itself as nothing but organised violence and deceit. Each new venture of the Committee has compelled the government to show its true face a little more clearly. The Official Secrets 'Trial' (where the entire defence was ruled out of order) is the most recent and blatant example. What has been revealed in the last few months has immense implications for all who are concerned with the abolition of nuclear weapons. The major political parties have all denounced the activities of the Committee of 100 as 'undemocratic'. Civil disobedience, they say, has no place in a 'free' society. Even Tribune has admonished the Committee for 'lacking patience' 1 All tell us we have 'democratic' methods of redress, exhort us to patience, and remind us of the many 'constitutional' channels open to us. Let us forget for a moment the desperate urgency of the problem confronting us, an urgency that has itself compelled us to increasingly radical methods of struggle. Let us take a cold and dispassionate look at the reality behind the glib patter of 'democracy'. Let us talk about 'democracy' as we have ourselves encountered it in the course of our struggle against the Bomb, not as we read about it in textbooks of constitutional law or as we hear it declaimed in the 'holier than thou' pronouncements of professional politicians. What is the content of the 'democracy' they talk about ? What are our 'democratic' methods of redress ? We would suggest that what is really meant by those who talk in this manner is that we have the right to play the game according to their rules. May we give a few examples ? We may write to the papers. But they will decide how much to publish, how much to suppress, how much to invent, how much to distort, and how much to smear. Workers in dispute know full well that the 'democratic' Press act in this way. The Committee's actions have brought this awareness to thousands of others. We may pass resolutions to our hearts' content . . . which they will put into waste paper baskets. It matters little in this respect whether the resolutions are sent to Downing Street or to Transport House. The road to Armageddon is paved with good resolutions! We may even gain Conference majorities for our policies. They will then reconvene the Conference, to get it to reverse decisions. 2 Or they will blandly assert that their Parliamentarians are not to be bound by a mere vote. 3 Decision-taking cannot be entrusted to the masses. Only the leaders can decide! Should one of our traditional political parties in Government ever be won to unilateralism, it would be faced by a refusal of the 'experts' of the General Staff to implement the policy. 4 Decision-taking on the matters that concern them most is never in the hands of ordinary people. It is always in the hands of minorities 'who know better'! Theirs is the power, for theirs is the control of the bureaucratic machine. In modern society ordinary people have no control over their own destinies. What about Parliament? What about it? We have the inalienable right to decide, every few years, by whom we wish to be misgoverned, and by whom ultimately incinerated. We have no control over our 'representatives'. We have no right of recall. M.P. 's don't obey electors, they obey Party Whips. We all know how concerned they are about matters of public interest! As pointed out in a recent Committee of 100 leaflet: "Members of Parliament were discussing how to spend £1,700 million on war preparations. The debates were often so poorly attended that on many occasions not even a quorum — 40 members out of 625 — were present!" No wonder people hold Parliament in contempt. Some probably thought they had a last resort. They would at least have the right to state their beliefs from a 'democratic' dock. Illusion again! Only our rulers can decide what a jury may hear and what conclusions it may draw! Firstly, it proposed action, something more than walking from Aldermaston every 12 months, something better than sending letters to the Prime Minister or to sundry M.P. 's, something more worthwhile than meaningless political manoeuvres in deserted Labour Party wards. Four years of marching, in increasing numbers, have achieved publicity for our aims, but little else. Signatures and petitions for 'Summit Talks' and 'negotiations' have proved futile. We are as near to war today as at any time during the past 15 years. The Russians have resumed atmospheric tests. They did so while 'negotiations' were in progress! The Americans may resume tests at any moment. To give the cynical farce a certain symmetry they will probably also do so while 'negotiating' a ban. So much for 'bringing pressure to bear' on the politicians of East or West! The second source of the Committee's strength is that it developed outside of the traditional organisations of the 'left'. This does not mean that it is 'non-political'. Far from it. But its values and methods are different from those of orthodox politics. Although there are different strands of thought on the Committee, the majority clearly recognises that the fight against the Bomb is a fight against the Government. For the Committee this is no abstraction. Its whole experience is there to sustain and reinforce this basic awareness. Many members of the Committee, moreover, sense that in the conditions of today the working class and the working class alone has the concentration, the cohesiveness and the power fundamentally to challenge the Establishment and its preparations for war. The activity of the Industrial Sub-Committee, the leaflets it has issued, the meetings it has organised in dockland and elsewhere, its attempt to approach ordinary workers at rank-and-file level, in the workshops, are all illustrations of this awareness. Finally, most members of the Committee are also aware of the fact that the struggle against the Bomb cannot be separated from the struggle against the present social system. We would go even further. We would suggest that the Committee is becoming more aware of some of the facts of political life than are many of its critics. Through activity, it is acquiring a clearer conception of the real power structure of our society. Experience is teaching it the futility of 'utilising' political parties, which are built-in stabilisers of the social system, as agencies for the implementation of its aims. There are few illusions about Parliament as a relevant vehicle for change. Despite occasional tendencies to 'slip back' into orthodox politics, the main development has been towards new methods of struggle. The major parties (and many of the smaller ones, too) are mirror-images of the bureaucratic society in which we live. They will never seriously challenge the present basis of society. Our rulers know this full well. These parties all stand for a conception of society, and a conception of politics, which permanently exclude the vast majority from management of the affairs that concern them most. They all believe in permanent divisions 5 into order-givers and order-takers. They only quarrel periodically between themselves as to who precisely should give the orders ! The Committee asks people to act themselves. It does not suggest that they pass resolutions requesting others to act on their behalf. It correctly senses the intimate relationship between the bureaucratisation of the 'traditional' organisations of the 'left' and the alleged political apathy of the population. Only mass action can solve both these problems. And this is precisely what the Committee is initiating. Why has this new movement developed outside the established organisations? Few would deny the feeling of indifference, if not contempt, experienced today for all traditional groupings on the 'left'. None of these organisations seem, even remotely, to come to grips with the preoccupations of ordinary people. All mirror Established Society, either East or West (there is little basic difference!). Many reject this society as meaningless and irrational, if not as frankly odious. No real 'alternatives' are presented by Tory, Liberal, Labour or Communist! All are corrupt, dishonest, seeking to use people and firmly in the hands of bureaucratic, self-seeking cliques. All vaunt what they will do — if only people accord them support, votes, money or time. None of them call on people to think and act for themselves, to have confidence only in themselves and in their collective will and strength. In all of them the leaders know best. Ossified ideologies conceal firmly entrenched social interests. Is it surprising that under these circumstances people (and youth especially) should be seeking a totally new banner? The Committee of 100 unambiguously proclaims an irreconcilable struggle against all nuclear weapons. It does not seek to use people's idealism and their desire to live in order to inveigle them into supporting actions and causes entirely alien to their way of thinking. It calls on people to take the solution of the most urgent problem confronting them into their own hands. This emphasis on militant mass consciousness and on autonomous mass action is entirely progressive. It is in fact the premise for any genuine change in the structure of our society. The third reason for the growth of the Committee is the completely new organisational conceptions it has evolved. Space unfortunately prevents us from dealing adequately with this aspect. We can only refer to the constant emphasis on collective decision-taking, the building of autonomous groups, the way supporters make themselves responsible for getting things done. These conceptions cut across the traditional political divisions between 'leaders' and 'led'. They also ensure the maximum participation of supporters at all levels of the organisation and at all levels of personal commitment. These forms, if developed still further and adapted to new techniques of struggle, could create an effective instrument for a challenge to the Establishment on a very wide front. They could also provide a framework for the reorganisation of society on a completely new basis. Stage by stage, the actions of the Committee of 100 have ripped off the mask of capitalist democracy. The government has been compelled gradually to withdraw the iron fist from the velvet glove. Revolutionary socialists have long proclaimed that the State is but the Executive Committee of the ruling class. Many who are not socialists are now, through their own experience, beginning to see how true this is. This developing consciousness was largely the result of successive acts of governmental repression. At each stage, it profoundly influenced the next acts of the Committee. It thus became the cause of further 'exposure' of the government — and of a further clarification of ideas on the Committee. It is worth examining certain of these landmarks in more detail. On the evening of 13th September, 1961, Scotland Yard announced a ban on the activities of the Committee over a wide area of Central London. The ban was to be operative all day, on Sunday, 17th September. Mr. Butler, the Home Secretary, granted his consent (under subsection 3 of section 3 of the Public Order Act, 1936) to Sir Joseph Simpson, Commissioner of the Metropolitan Police, to issue an Order to this effect. The order, written in typical bureaucratic jargon, 'prohibited the holding of any public procession organised by the body known as the Committee of 100, or any public procession organised by any person or persons on behalf of the Committee, within the following thoroughfares and the area they bound'. There followed a carefully thought out list of London streets, bridges, passages, etc. Much midnight oil had obviously been burnt by Simpson and his colleagues. The Committee announced that its demonstration would proceed, as arranged. The kept press let loose a barrage of intimidation and threats. But it all proved to no avail. The resort to the Public Order Act had, of course, exactly the opposite effect to the one intended. The best laid schemes of bureaucratic mice and metropolitan commissioners went a'gley. Thousands rallied to Trafalgar Square on Sunday, 17th September, in defence of the right of assembly. The implications of this deliberate and massive flouting of the law cannot be over-estimated. They imply a realisation that 'laws' are man-made and that they can be broken by men. They point to a corrosion of the authoritarian 'mystique' on a truly massive scale. They suggest a genuine will to struggle, a will that goes beyond the most radical resolution submitted to a Labour Party meeting by the most 'experienced' of professional revolutionaries! Here at last was struggle being taken beyond the 'constitutional' limits, tolerated by the authorities. Here were thousands of ordinary people prepared to act. Here they were breaking the law in the full knowledge of what they were doing, and conscious of the impact of their collective will. For those of us to whom socialism means, above all, the self-assertion of human beings over the imposed conditions of their own existence, the demonstration of 17th September was a very significant event. The 17th September had another important effect. It brought to light facts about the police which are part and parcel of working-class experience but are perhaps less familiar to the average Committee supporter. The Committee's action focused a dazzling beam of light into these dark recesses, illuminating them for all to see. The National Council for Civil Liberties issued an excellent pamphlet on the subject. 6 'Questions' were asked in Parliament — and the usual evasive answers obtained. On 1st October, the Observer printed an Abu cartoon depicting police behaviour in the Square which so incensed the Police authorities that they felt compelled to complain about it editorially, a few days later, in the Police Review. The 17th September demonstration brought thousands of demonstrators up against the realities of our society. The Press, the Police and the Courts were revealed for what they were. The close relations between them — and between them and the Government — were clearly shown up. But so were the official organisations on the 'left' — who either denounced civil disobedience, abstained from comment on the matter, or learnedly lectured the demonstrators on the inadequacy of their methods of struggle! On 17th September, the Committee of 100 started writing its own history and elaborating, in action, its own theory of 'do-it-yourself' politics. It is not often that socialists get an opportunity of seeing 'their own' ruling class in all its naked and cynical brutality. The Wethersfield demonstration of 9th December showed 'our' rulers up in their true colours. The announcement that the Committee intended to hold demonstrations outside bases let loose a Press onslaught of a kind we have not witnessed for many a year. "Anti-Bomb invaders get 7 years jail warning" screamed the Daily Mail on 8th December. "Guards might shoot," headlined the Sunday Telegraph on 26th November. The article went on, quite explicitly: "Americans have opened fire at both bases on several occasions in the past. They will do so again . . ."
On 7th December, the intimidation was voiced from within Parliament itself. Mr. Renton, Minister of State, warned Committee supporters of the "gravity of the offences" they were contemplating. Their mere presence in the neighbourhood of "prohibited places" might constitute a "felony". Mr. Brown, deputy leader of Her Majesty's so-called 'Opposition', duly echoed the warning. He asked the Minister to be sure "plans were well laid to ensure that law and order are operative". Mr. Renton said he "greatly appreciated" Mr. Brown's concern. As if sensing the limited value of this verbal intimidation, the Press gave wide publicity to the physical precautions the Government were taking. The Tory Press did this quite crudely. The Guardian spoke neutrally of "12 foot wire fences being erected round Wethersfield air base" and of between "2,000 and 3,000 civil and military police, some with dogs, being organised in its defence". It warned its Liberal readers that "R.A.F. police, U.S.A.F. police and Air Ministry police would be on duty, with more than 800 officers from the Essex County Constabulary, the Metropolitan police, the Hertfordshire police and the Southend police". Would Labour speak in a different voice? The Daily Herald menacingly described the "fantastic 10-mile ring of barbed wire" surrounding the base, stated that "three hundred Royal Fusiliers from Colchester had suddenly been ordered to the spot after secret talks between British and American Service chiefs, Scotland Yard and local police". It spoke, rather discouragingly, of "American Air Force police armed with sub-machine guns, manning watch-towers day and night" and of "American Voodoo jets, keeping up their ceaseless vigil". Going one better than the Mail, it speculated on possible penalties of "up to fourteen years". The Establishment, both 'right' and 'left', spoke up in total unison. What was at stake was their right to decide. When the Committee made clear it would not be intimidated, the Government sought to decapitate the movement. It resorted to early-morning arrests and to searches of premises. It even sought to prevent the demonstrators getting to Wethersfield. On the morning of 9th December, the Daily Telegraph announced that the "Traffic Commissioners had withdrawn the operators' licence from the coach company which was to have carried the demonstrators to the NATO base at Wethersfield". Various clumsy attempts were later made to whitewash this disgraceful episode. It is against this background of massive intimidation that one must assess the significance of the Wethersfield demonstration. The Press unanimously called it 'a flop'. Was it? That several hundred people turned up at Wethersfield, despite the material difficulties and despite the concentrated propaganda barrage, bears testimony to the temper of the movement developing around the Committee. We doubt whether any other organisation could have mustered such numbers for an action entailing such risks. As Bertrand Russell put it: "The weakness of the Establishment is shown by their rejoicing in so shabby a success. What did the demonstrators risk? They risked prison, loss of livelihood, not improbable physical injury." We admit that there were mistakes. False optimism was never an asset to a serious movement. A sober reassessment points to obvious tactical errors which should not be repeated. It was wrong to boast of the vast numbers expected. This could only give ammunition to our opponents. (If large numbers had turned up, this would have been a triumph for the Committee. If they had not, no one need have felt demoralised). It was never clearly agreed how few would be 'too few' to 'walk on', nor was it clear who would decide in the end. But these are relatively minor points. Judgment can mature much as consciousness develops. Wethersfield gave our rulers real cause for concern. Air Minister Julian Amery does not usually, we understand, spend his Saturday afternoons in helicopters. Not since the days of the General Strike had the Establishment felt compelled to display such force in peace time, against 'its own' people. State action, during these two demonstrations compelled the Committee's active supporters to re-examine some generally accepted conceptions about society. In the process, they achieved a new level of consciousness. It is important that others who oppose the Bomb should also realise the full implications of their opposition. The minority, who take all the decisions concerning the manufacture, testing and possible use of the Bomb also control both the 'constitutional' channels of protest — and the organs of coercion (for protests which escape from constitutional channels). This fundamental division between those who take and impose the decisions and those who are compelled to execute them permeates every aspect of modern society. It is, for instance, everyday experience in the field of production. Members of CND should realise that the struggle against the Bomb is a struggle against a whole hierarchical organisation of society. This is the mask behind which 'the few' conceal their right to annihilate the many. To defend this special right they will use their special rights in all the other fields. The Bomb is thus the symbol of the authoritarian society. The events of the 'Trial' point to much the same conclusion. A genuine struggle against the Bomb, against this particular minority right, will involve us in a struggle against all their sources of power. This is synonymous with the struggle for the complete democratisation of society. To us, this is also the meaning of socialism. Why did this trial take place ? Why did the State risk laying bare its disregard for its own 'justice' ? The growing alarm of 'our allies' and of the military, the indignation of the Press, of Parliament and of 'responsible opinion' — all added up to a considerable pressure on the judiciary to do something drastic about the Committee. As always when faced with large numbers, it chose vicious victimisation. Of course the Attorney-General was at pains to deny his motives. "This is not a political prosecution. The accused are not being prosecuted for an offence of a political character or on account of any views they may hold. They are being prosecuted on account of their conduct." 7 Again, "This is not a prosecution by the Government. They do not prosecute and they have no responsibility for instituting prosecutions. Indeed, the Government cannot direct a prosecution such as this to be instituted. This is the point I want to emphasise once again: this prosecution is brought solely and simply because they have deliberately broken the criminal law of the land." But the Judge was rather less cautious. "I have to pass a sentence which is adequate to the offences that you have committed and which will deter others front committing similar offences." This was more important to him than the Jury's unanimous recommendation for leniency. The State did not expect that the Six would choose such a militant line of defence. It had not bargained for the suggestion that its own policy was in fact "prejudicial to the state! " A problem was now posed. If a defence was to be allowed on the question of what was 'prejudicial to the safety and interests of the State', then the State's own machinery would be used for the dissemination and public assessment of the full facts. The defence was disallowed. But in refusing to allow this defence to be heard, the State contravened yet another of its essential interests: to appear to be democratic and just. These then were the objectives of the Prosecution — to get a conviction; to keep out the facts about nuclear 'defence'; and to maintain some semblance of justice. To reply to the charge of action 'prejudicial to the safety and interests of the State', the defence needed to give evidence of two kinds — the facts about nuclear weapons, and expert opinion about our defence policy. There were no valid arguments by which the Attorney-General and the Judge could keep all this out, so they resorted to tactics of confusion. "This Court is only concerned with facts" they both said, again and again. The opinions and beliefs of the accused were not relevant. By an extension, expert opinion was not relevant. By a further extension, the reason for those opinions (i.e. THE FACTS) were not relevant. So this Court was "only concerned with facts" that assisted the prosecution ! ! ! "Any interference with the ability of those aircraft to take off would gravely prejudice their operational effectiveness." Air-Commodore Magill then gave evidence for the prosecution that Wethersfield was a U.S. Air Base (fact). The planes were vital to the defence of Britain and other countries in N.A.T.O. (opinion). They were combat-ready and at constant alert-ready to take off at any time (a pious hope?). All expert evidence for the defence, tending to show the Government's policy to be dangerous, was just incompetent! Air Commodore Magill was asked on 14th February, 1962, how far Wethersfield was from London. He replied : "About 50 miles — in a fast plane". On this basis the Judge gave his ruling as to what evidence was admissible. He was unable to accept defence counsel's arguments and agreed with the Attorney General. Surprise! He ruled out all cross-examination "relating to the advisability of the deterrent, 10 and on the question of accident and the attraction of hostile attack to this aerodrome". Pat Pottle was conducting his own defence. Once it became clear that his whole case was to be ruled out, his objective was simple. It was no longer to establish the facts, it was to establish that they were being excluded! This he did in the most telling manner, compelling public opinion to focus on the issue. Learned counsel would have had to accept the spirit of the Judge's ruling. Through his 'ignorance' of Court procedure Pat Pottle was able to raise all the relevant questions and show in detail just what evidence was being kept out. Cross-examining Magill, Pottle asked how much time we would have in an emergency, whether everyone in the country would be notified, 11 whether it would be beneficial to anyone if bombers took off with nuclear weapons in the event of this country being attacked, whether people outside the government machine could judge what national security required, whether Duncan Sandys was right in saying bases could not defend people, whether Macmillan was right either when he referred to the dangers of war by miscalculation or muddle-or when he denied the possibility of war by accident. Magill's expert opinion on these matters should doubtless have been "accepted as conclusive". Unfortunately, after each question the Judge intervened. "Where are we getting to? . . . I can't allow that . . . Don't answer that . . . You can't mention that . . . It is irrelevant . . ."
"The rule of law protects our rights and privileges such as freedom of speech." The Judge commented, when he ruled out the whole of the defence case, that there was always the Court of Criminal Appeal which could review his decision and would put him right if he were wrong. He was obviously aware that he had just committed the Jury to returning a verdict of 'Guilty'. In his summing up the Judge repeated that the Jury were the sole judges of the facts. "I am not. From the evidence you find the facts, 13 To the facts as you find them you apply the law as I lay it down to you. And so you arrive at your verdict." Later, the Judge suggested that the verdict was "the only possible one they could bring in on the evidence of this case". So much for the rights of the Jury to decide for themselves. All evidence had been kept out that could have allowed them to reach a verdict of 'Not Guilty'! Some people believe that in trials it is the Jury who decide the issue. In this particular trial the Judge was taking no chances. "It must be prejudicial. It is part of the defensive system of our country and Parliament recognises it as such. If you impair that defensive system surely it must be prejudicial." Within the narrow terms of the State's own legal system, within its own rules, we have shown the perversion of State justice that took place. But how narrow are those terms ! The Judge's own words are the evidence. "It is my view that an honest belief is irrelevant." If all else was excluded, suggested Pat Pottle, the case for morality would surely not be. "In my view it is not relevant," said the Judge. The prosecution's chief witness declared himself ready to commit genocide. He was 'an officer of the Crown', and would obey orders. The question whether civil disobedience is justifiable when the order is immoral could not be discussed. References to Eichmann, the Nuremberg Trials and the Christian Martyrs were disallowed. "It has nothing to do with this case." Here the Judge was doubtless right in law. This just reveals the nature of the law. Its basis is not an abstract conception of justice or morality. It is the day-to-day requirements of the State. This was a major political trial. The Government's whole defence policy was challenged. 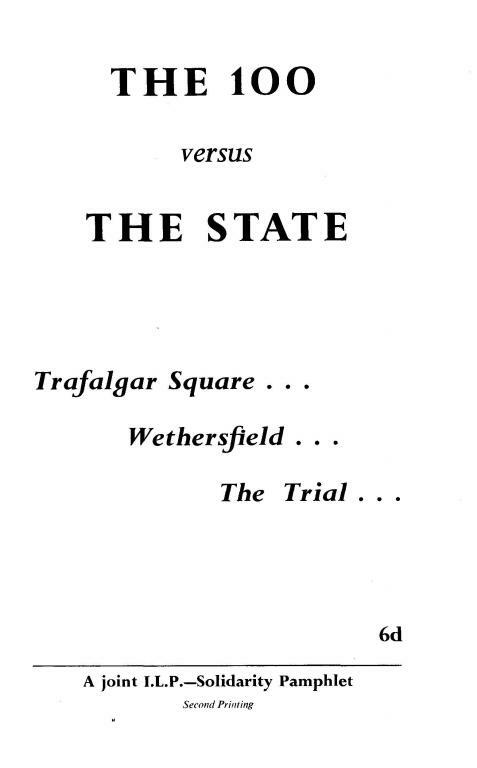 Could the Judge remain impartial between the two views of the 'safety of the State'? "Parliament," he said, "is answerable for the security of the people." As we go to Press, the Lord Chief Justice, Mr. Justice Ashworth and Mr. Justice Hinchcliffe are burning the midnight oil. They are putting in writing their reasons for dismissing the appeal. We do not envy them their task. There were no other experts according to the Attorney General. "On the evidence of Air Commodore Magill, the proper officer who had knowledge of these matters on behalf of the Government, it really was not open to the defence to contest that evidence." He went further. "The only criticism I had of the Judge was when he said that it was open to the Jury, despite the evidence of the Air Commodore, to find that it was not prejudicial. On that evidence there was no answer. If it is given in good faith, such evidence must be treated as conclusive." The problem facing the Appeal Court judges was well posed in defence counsel's reply: "If the submission for the prosecution was correct, the function of the Jury under Section 1 of the Official Secrets Act was entirely removed and it would be impossible for anyone to put up any defence at all once the competent or proper officer had given evidence. Any defence in criminal matters might appear to be ridiculous, but it did not mean that people could not put it forward. It was not for the Court to say that a defence was ridiculous. It was for the Jury to decide that." The 'Trial' has shown quite clearly who takes the decisions. "Those who are responsible for national security must be the sole judges of what the national security requires." They decide when to push the button, they decide how much opposition to tolerate, they make the laws and decide which ones to use, they decide what the Jury shall hear. They rule every aspect of our lives. They are accountable to no one but themselves. If mankind is to survive they must be removed. How far can civil disobedience get us? Several factors determine its limits. They are the extent to which people are prepared to make sacrifices . . . and the extent of the repression thus provoked. The most important factor is the effectiveness of civil disobedience compared with that of other methods of action. It would be futile to deny a certain disillusionment among Committee supporters when confronted with the ruthless reality of State power. Many have begun to think anew about the way forward and to question whether 'more of the same' is really worth while. This 'soul-searching' has both good and bad aspects. Several conclusions may be drawn from an awareness that sitting down will not ban the bomb. One conclusion is that we should return to orthodox politics. This would be disastrous. Orthodox politics have got society into its present mess. A more valid conclusion would be that new forms of action are needed, drawing more people into the struggle. Absolutely crucial in this respect is the turn towards industrial workers. What does industrial action imply ? It implies a conscious turn to the working class. This will not be an easy relationship to establish. There will be the constant danger of raising artificial issues, of raising issues too soon or in a doctrinaire, 'external' and purely agitational manner, separated from the real pre-occupations and concerns of working people. But with common sense and patience, these dangers can be overcome. And, as more workers come to support the Committee, the dimensions of the problem will gradually lessen. There are no absolute guarantees that it will be possible to achieve this essential link. What is certain, however, is that certain actions can be guaranteed to prevent it. The greatest danger here is an ignorance of the identity of the working class, a tendency to confuse its face with its 'bureaucratic posterior', a wish to turn the campaign in the direction of the apparatus-men of the trade unions or of vote-seeking Labour politicians instead of towards the rank and file, at their places of work. Were the Committee to make this tragic mistake it would be dubbed — and rightly so — as no different from all the other outfits. Its growing appeal rests on the fact that it is not identified, in its ideas or in its personnel, with any part or parcel of the Establishment, either 'right' or 'left'. There is a skeleton in the CND cupboard, the skeleton of the Labour Advisory Committee. It points a warning finger at what is not to be done if the Committee of 100 wishes to win the working class to the idea of a struggle against war. The Labour Advisory Committee consisted of names, of Labour personalities, of various union leaders and of sundry Labour MPs. It proved ineffective during the several years of its existence. It never really got down to initiating a campaign among industrial workers. Its members saw nothing inconsistent in sitting on the Committee part of the time and in repeatedly voting the Service Estimates in 'The House' at other times. Or in apologising for those who did so. Party loyalties — and the jobs that went with them — always came first. What is now needed is rank and file support and people who will see the struggle against war as a serious business. Much the same conceptions should prevail in the industrial work of the Committee as prevailed in its approach to civil disobedience. No more should be advocated at any stage than a substantial proportion of supporters are prepared to accept. Just as civil disobedience progressed from the Defence Ministry sit-down in February to the massive law-breaking of 17th September, 1961, so the trade union work should develop with its own momentum, from fairly small beginnings. As a first step, industrial workers should be asked to participate in the ordinary activities of the Committee (meetings at work to explain civil disobedience, local meetings, building of links between various sections of the movement). Groups of Committee supporters should be set up in various industries and factories to discuss, on the basis of detailed inside knowledge, how best they can assist in developing a militant mass consciousness among their workmates and what types of industrial action would be best suited to their particular industry. At a somewhat later stage groups of workers in certain industries could envisage partial forms of industrial action. Many people use this term as synonymous with strike, but in fact it covers much more than is usually realised. A 'refusal to handle' selected cargoes could have a very important effect. Industrial workers could in this way retain their jobs while considerably assisting the objectives of the Committee. The all or nothing approach of certain political groups in relation to industrial action has always struck us as particularly unrealistic. The nothing part of it usually prevailed. Basing oneself on how successful earlier forms of action had proved, one could, at a still later stage, envisage action on a regional basis, or on the basis of one or more industries, or even on a national scale. How would the Government react to such developments? It would reveal still further the fraudulent nature of capitalist democracy. It could attempt intimidation by invoking legislation which is already on the statute book but of which ordinary people are quite unaware. Or it could churn out new legislation so quickly that it would amaze those who judge Parliament by the rate at which it copes with 'unimportant' things such as houses and pensions. Or the Government could use troops to break industrial action developing against the Bomb. Such methods could for a while succeed. But each of these steps has a remorseless logic of its own. People feel strongly about the loss of their hard-won democratic rights. Each repressive measure would call forth counter-actions which neither the conditions nor the mood of today allow us to foresee. The struggle would develop in many fields (right of free speech, rights to assemble and demonstrate, trade union rights, right to strike). This conjunction of struggles, involving millions of people in a fundamental assertion of themselves, could transform society. Then, and only then, will the road open up which leads from civil disobedience to the social revolution. The industrial work of the Committee should draw its inspiration from the Committee's own tradition of action. It would be disastrous for the huge majority of the Committee's active supporters, who are not industrial workers, to begin posing industrial action by others as alternative to continued civil disobedience by themselves. The challenge is considerable. Its basis is that people should take into their own hands — and through actions best suited to their own particular circumstances — the solution of a problem that confronts us all. 1. Editorial, 5th May, 1961. 2. Sir Tom (now Lord) Williamson, of the National Union of General and Municipal Workers, set the example in 1960. 3. This is a familiar one to Labour Party members. 4. Readers may recall how Montgomery threatened to resign when the Labour Government considered abolishing conscription. 5. Within society and within their own ranks. 6. The N.C.C.L., 293 New King's Road, London, S.W.6 (price Is.). 8. "It is difficult to make the facts known to ordinary men and women, because Governments do not wish them known and powerful forces are opposed to the dissemination of knowledge which might cause dissatisfaction with Government policies." Act or Perish, Committee policy statement. 9. Rather like the Pope, speaking ex-cathedra! 10. i.e. whether it is 'prejudicial to the safety and interests of the State'! 11. The Judge gave the answer to this: "These are highly confidential matters . . . I shall have to clear the Court". 12. The answer to this is in a written affirmation (also excluded) by John B. Witchell, who in 1959 resigned his position as Defence Scientific Service Officer with Canada's Defence Research Board. He points out that warning systems are unstable. As a scientific fact, not a matter of opinion (even professional opinion), the probability of a false alarm approaches statistical certainty. 13. Not an easy task, since the facts had been so systematically excluded from the evidence. During an intervention in Linus Pauling's evidence, Pat Pottle said: "I am not trying to bring facts in, my Lord. What I am trying to establish is that Dr. Pauling is an expert. I know you have ruled the facts are irrelevant." The satire was lost on the Judge. "It is not much good getting his qualifications as an expert if he is not allowed to give the facts." Pat Pottle then attempted to ask a question about governments trying to suppress facts. "Quite immaterial," said the Judge. 14. All quotations in relation to the Appeal are from The Times, 3.4.62. Mate, I can't thank you enough for all this! It's brilliant, I knew you were scanning them but didn't think you would have time to OCR them as well, really great stuff, thanks. Just a small note, I need to fix the tags to put them in the main Solidarity archive. Solidarity texts should just have the tag "solidarity" in the authors/groups box. I will work through the ones you have done so far.